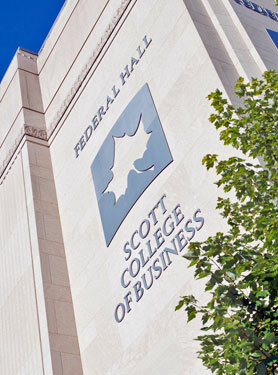 Networks Financial Institute in the Scott College of Business at Indiana State University is pleased to welcome you to our conference "The Big Bang for the Affordable Care Act: The End of Health Care Financing as We Know It?" The Patient Protection and Affordable Care Act (ACA) of 2010 was the first signature legislative accomplishment of the Obama Administration. But it has remained very controversial and a subject of great uncertainty, in large part because of its sweeping nature and the importance of the industries that it affects. The Act aimed to improve access to and affordability of health care financing and health care delivery for most of our citizens. While a few major changes took effect immediately, the most sweeping changes were set to begin in 2014. The 2014 "Big Bang" included penalty-backed mandates for employer provision of health care insurance and for individual coverage and new schemes for provision of individual insurance by states. Court fights over the legality of the ACA have largely run their course without significantly impeding its implementation. There have been important glitches with major provisions, however, especially the "employer mandate" postponed until 2015, a tax on so-called "Cadillac plans" postponed for several years, exemptions for the required premium distribution for small employer insurance plans for low income and part-time workers and a relaxation of the Federal requirement for states to extend Medicaid to a broader group of new participants. So the Big Bang is near, a little battered and altered and with much uncertainty remaining, but it is otherwise on course. Today, leading scholars will discuss their work examining public policy issues raised by the ACA and its implementation. Other experts will discuss the implementation, employer’s reactions and perspectives, and the problems and opportunities faced by insurers, health care insurers and providers and the insured. Our Keynote speaker, Jonathan Gruber, Professor of Economics at MIT is well positioned to give us a road map on the issues confronting all of us, where we are and where health care insurers, providers, employers and individuals are headed as we move through and past the Big Bang. Professor Gruber, was the architect of the Massachusetts Health Care Insurance Plan, the forerunner of the ACA and a key adviser to the Obama Administration in the development and passage of the ACA. We have a great line-up of thought leaders with us today. We welcome you and we look forward to your participation in today’s discussions.